Rare Replay time! We got the collection some time ago and two final games in it had been laying dormant for a while, so now it’s time to get through it – ticking them both off around the same tie makes things easier for me. I’ve played Banjo-Kazooie a long time ago – as game 29! – and more recently played the building-focused Nuts and Bolts that was a more recent release. 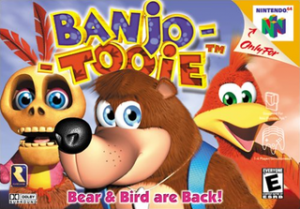 Banjo-Tooie is the contemporary sequel to the first game, which considering the gap of over seven years should be an interesting challenge to pick up on again! One of the things that I think sets a lot of Rare games apart from other developers is the character the games tend to have. I’ve mode a note that the dialogue is quite corny – pun filled and such – which sets the atmosphere for a game that leans towards the goofy. There’s a focus here on making a family friendly, fun gmae, and it pays off to create something charming. Add to that the large, colourful and animated worlds that you move around in. As per the usual style, there are a bunch of collectibles and quests, here yielding puzzle pieces, that give you a lot to do in each level. As you learn moves as you go on, you have a good reason to go back to them to get some of the extra items. It can be a lot to keep track of, but it’s usually worth it. One of the big ways in which Banjo Tooie expands on its predecessor is in how it adds those abilities. Not only does it give our heroes new movies, It also allows you to take control of other characters in the world with their own skills. Sometimes this is more or less as long as you want, but others are limited time which adds some urgency on the puzzle solving you need to do. And then there are the FPS-like action segments that are clunky, but so different and out there that they feel amazing on their own. Banjo Tooie takes Banjo Kazooie and expands it quite naturally, with the original first level seeming small now. It’s quite well done, without overextending itself, but it feels like there’s so much to it. It doesn’t always all work, but this game controls well, plays well and has so much charm that I can forgive that it might not be perfect.